Find an advocate. A savvy staff member or elected official can open doors that seem permanently sealed shut. Look for grey areas. There's more flexibility within the law than you might imagine, and it just might allow your wild street art scheme after all. Question authority. If a rule doesn't make sense to you, say so. Even better, offer a solution. San Franciscans with bright ideas for streets can learn how to make their dreams reality by visiting a site put together by the City’s Planning Department, Department of Public Works, San Francisco Public Utilities Commission, and San Francisco Municipal Transportation Agency: www.sfbetterstreets.org. 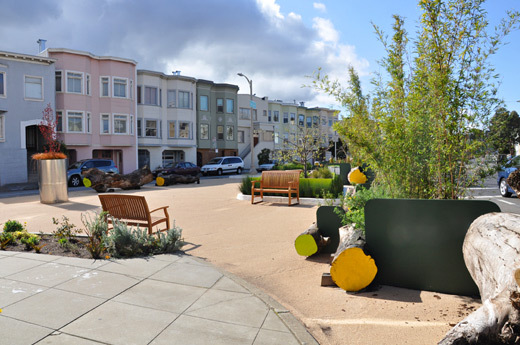 The site includes dozens of pages on information on permits, maintenance, codes and guidelines for each type of streetscape project. It also includes a friendly, easy-to navigate interface and welcoming look, important elements that can easily be forgotten in the world of rote government websites. As the web increasingly becomes the "front counter" of city departments, sites like this one can help engage the public and encourage the creative use of street space that transforms the pedestrian environment. My favorite part? The way the city calls them street openings on their website, instead of the outmoded street closings. It's a small thing, but it represents a big change in thinking about which users should have priority on local roadways. In order to make his neighborhood more livable, Jason Roberts had to break the law. In fact, he and 1,500 other people didn't stop at just one city ordinance; they violated dozens of them, more than once, without getting caught. But their idea definitely caught on: Since April 2010, when they revolutionized their Oak Cliff block in Dallas, Roberts' Better Block initiative has spread to more than twenty blocks across the country. 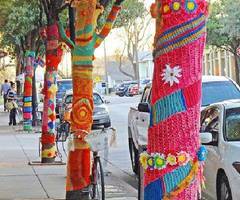 From DIY crosswalks to yarnbombing, sometimes it takes a little insubordination to make your street into something everyone really wants. I think this is great a way to demonstrate a street's potential, and raise awareness of problem regulations that prevent good streets from happening--but of course, the real solution is the (long and often tedious) process of changing those rules.